Gia Lai (VNA) – Deputy Prime Minister Nguyen Xuan Phuc has agreed to allocate 2,000 tonnes of rice to people, especially ethnic minority groups, in the four Central Highlands provinces of Gia Lai, Dak Lak, Dak Nong and Kon Tum which have been hit hard by drought. 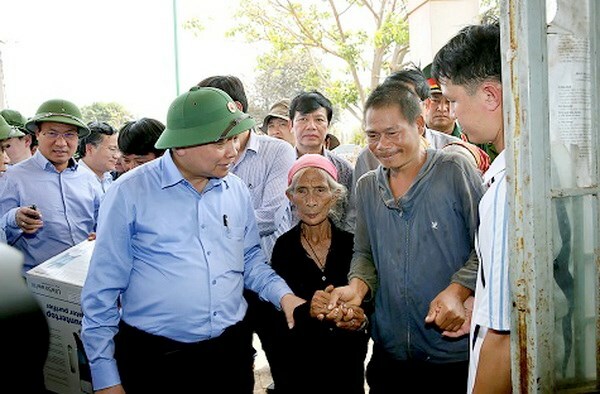 During his tour of Gia Lai province on March 24, the official requested the Central Highlands localities to minimise losses caused by the natural disaster and exert all-out efforts to help locals stay away from hunger, water shortages and disease. Hydropower stations in the localities should discharge water at the maximum level in order to meet people’s demands, he said, stressing that the immediate task is to protect areas of commercial forestry. The localities need to focus on afforestation, especially in the upper reaches of rivers and other important areas, in a bid to cope with natural disasters in the long-term, the Deputy PM noted. The same day, the official made a fact-finding trip to Chu Don commune in Chu Puh district where many hectares of rice fields have been destroyed due to drought. Vising H’Bong commune, one of the localities in Chu Se district suffering the worst water shortage, Deputy PM Phuc promised that the Government and local authorities will not let hunger, water shortages and diseases afflict locals. He suggested local farmers and authorities study to cultivate other crops more resistant to drought. Statistics show that up to 95,000 hectares of trees in the Central Highlands region are facing water shortages. Water levels in most of the local irrigation facilities has shrunk by more than half. According to the regional Meteorological and Hydrological Station, nearly 170,000 hectares of plants will be affected by drought if the heat wave lasts until June.